As cats can’t brush their teeth the same way that humans do (for obvious reasons), it is important to find a way for them to maintain their teeth and gums healthy teeth and strong. One of the best ways to ensure that your feline friend has a good oral health is by providing them with cat chew toys. Not only do cat chew toys improve the quality of their teeth, but they are also a fun way to keep your cats busy and entertained. This list reviews some top cat chew toys, looking at their features, pros, and cons. Ideal for: This chew toy is perfect for all cats. Petstages keeps playing fun with their catnip tons of tails toy. This toy has three textures that are guaranteed to keep your cat interested. Plus, it is filled with catnip, which is bound to have an effect on your cat. You can easily toss it around and play with your cat. Filled with catnip, but not overwhelmingly strong smelling. The streamers keep cats excited and interested. The ball is extremely lightweight and easy to toss around. Some cat owners find that the strings on the ball are too short, and the cat loses interest quickly. The toy might fall apart fast. This toy is quite small. Ideal for: All cats and kittens who need a stronger and healthier smile. This chew toy for cats is the perfect choice for keeping your cat’s teeth healthy. The bright and colorful design is sure to entice kitties and keep them playing and chewing for hours. The toy is made up of a ring with chewy spikes and two fabric steamers. 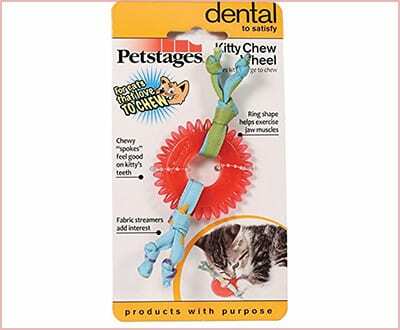 This dental chew toy works to remove plaque and tartar from your cat’s teeth. The toy is made using high-quality materials. It is fun and durable. Some cats are able to chew off sections, so inspections prior to and during long play periods are recommended. The ribbons are not soft. Ideal for: This toy is great for cats of all ages. 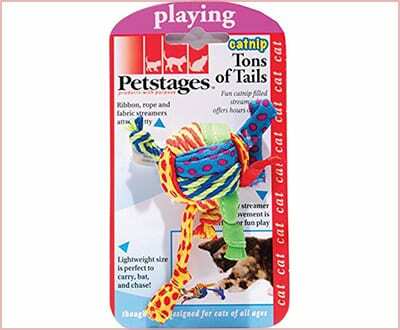 Petstages is known for designing quality cat toys that are fun to play with and good for oral health. This chew toy is perfect for cleaning teeth and removing tartar, to ensure your cat’s teeth and gums are healthy. The netting that it’s made of is quite resistant, so it won’t unravel. 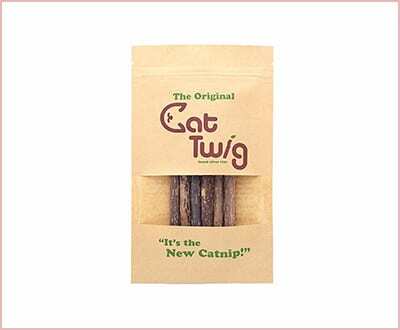 These cat chew toys are filled with both fibrous catnip stalks as well as catnip, to encourage your cat to chew the toys. This toy is extremely lightweight, so it is easy to carry, chew, and bat around. The toy contains knotted streamers that are fun to play with. Some of the tassels can come off quite easily. Some cats ignore this toy. Ideal for: These cat chew toys are perfect for cats of all ages, but work especially well for cats that are anxious. These CatTwig vine toys are 100 percent natural and unprocessed. This item comes in a pack of six, and works well to improve dental health and relieve stress for cats. This can serve as an alternative to catnip toys. Your cat might react to this toy by purring, chewing it, licking it, and running and rolling. These CatTwig toys are high potency. They come in a re-sealable container to make sure the twigs stay fresh for every use. Nibbling on the bark helps remove plaque from cat’s teeth. Some cats are not interested in twigs. Cats might chew on these twigs fast. Quite expensive for what they are. Ideal for: Any little fluffy cat or kitten. 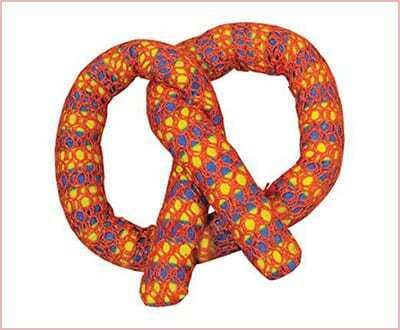 This plaque away pretzel by Petstages is the perfect chew toy for cats. The bright orange netting works well to remove soft tartar from your cat’s teeth as they enjoy playing with the toy. The toy contains catnip, which will attract your cat and keep its interest. This pretzel is lightweight, making it extremely easy for cats to carry and bat. This toy contains catnip, which works to keep cats interested in playing. The toy improves your cat’s dental health. The size is much smaller than some customers were expecting. Some cats are not interested in this toy. Cats might get bored with it quickly. Ideal for: All cats, especially those that are more active at night. 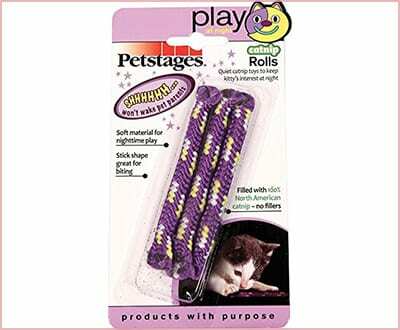 These catnip rolls by Petstages are a wonderfully quiet toy that will keep your cat entertained. The soft and quiet material makes them a great toy for nighttime use. The toy is filled with North American catnip, and it contains no other fillers. These rolls are the perfect shape for biting. The catnip filled rolls are soft enough to chew on continuously. Some owners report the ends of the rolls to be sharp; however, none have reported any injuries as a result. Not suitable for aggressive chewers. The toys are smaller than expected. 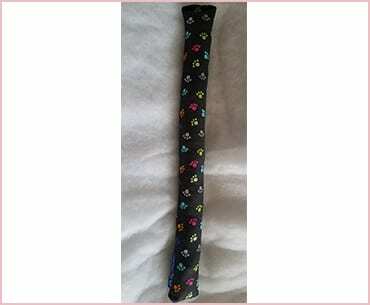 Yet another toy that contains catnip and has a stick shape, this one from Happy Kitty is larger, which makes it suitable for cats, not kittens. You cat can chew on it and carry it around, since it is easy to grasp in its teeth, due to the elongated shape. The toy is perfect for carrying around. The toy is not suitable for small cats. Ideal for: This toy is soft, so it is more of a kitten toy. 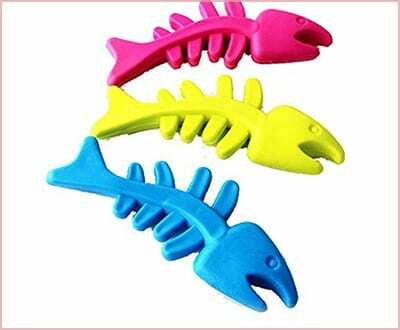 These fish-shaped rubber dental chews are a fun-designed toy that keeps your cat happy and healthy. This high-quality product contains non-toxic materials that are safe and fun to chew. 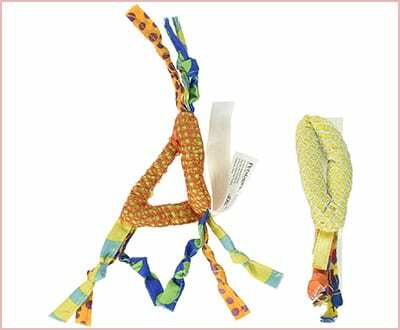 These toys are great for throwing and fetching, since they are lightweight. Its fun fish shape and bright colors work well at keeping cats interested in this toy. The surface texture removes tartar from teeth. Lightweight, so easy to carry around. This toy is not a great option for adult cats. The color choice is random. Ideal for: This toy is perfect for any cat or kitten. Let your cat enjoy the presidents just as much as we do with their very own presidential parody toy. 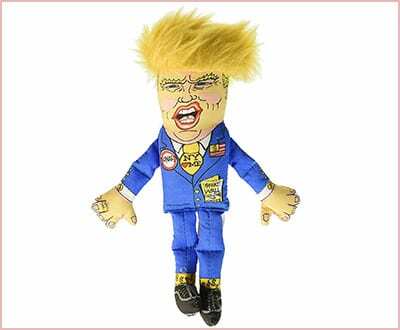 This presidential cat toy contains catnip to ensure your cat stays interested and plays with it for hours. The toy is non-toxic, and it is printed on a blend of poly and cotton. This toy comes in 5 different designs, each containing bright colors and a funny face. The toy is floppy, perfect for chewing. The squeakers do not seem to work well. The toy is not that resistant. The filling might be unsafe for your cat. Ideal for: Cats with some puzzle experience. 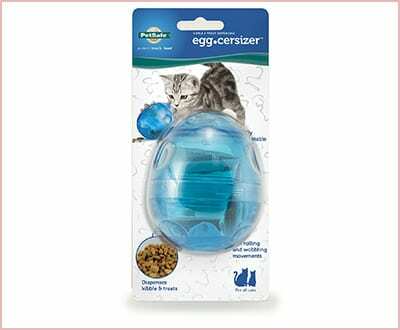 The FUNKitty egg cersizer is the perfect chew toy for your cat. This interactive toy works well at keeping your cat interested by dispensing treats as they play. You can use it to control the amount of food your cat eats since this dispenses small portions. The opening is adjustable, allowing you to increase or decrease difficulty. It works to improve cat’s digestion by feeding them smaller portions. This toy works well at encouraging weight-loss through controlled portions and increased exercise. Not a fun option for cats that are new to puzzles. You might need to teach your cat how to use it. The toy might not roll on carpets. This toy can be noisy. It is important that you choose cat chew toys that help improve your cat’s dental health, and that keep it entertained. Choosing any of the cat chew toys on our list will assure you that your cat’s oral health and entertainment is in good hands – or paws – for many years to come. Do you have other cat chew toy suggestions? Leave them in a comment down below!